In-house SIEM is expensive to set up and operate. The right managed service provider can provide better for less. Don't believe us? Paul Davies has the figures. Do nothing, and risk failing to identify and respond to threats. Implement and self-manage an in-house security operations centre (SOC), providing 24/7 security information and event management (SIEM). Partner with a managed SIEM service provider. Honestly, if you value your business the first option is a non-starter, so I wanted to explore the differences - and the costs - involved in either setting up your own SIEM service, or partnering with a third party. SIEM isn't an off-the-shelf proposition, so setting up an in-house service is involved, and maintaining it is costly. To even get started you'll need managerial expertise, then you'll need to recruit a team of staff, train them with additional skills, and provide them with the necessary tools and threat intelligence. With a managed security service provider (MSSP) you pay a fixed fee for agreed services. In a like-for-like comparison, the MSSP will be responsible for setting up and managing the system, and providing the necessary security analysts, researchers, incident response, forensics and compliance audit expertise, along with the ongoing threat intelligence and analysis, incident response, investigation of priority alerts and regulatory reporting. The MSSP is also responsible for the technology underpinning the service: software and hardware as well as the intrusion, forensics, workflow and reporting tools, and threat intelligence. What about the costs? Below we've laid out a typical pricing example for a mid-sized organisation setting up its own SOC-managed SIEM service, versus partnering with an MSSP. Any business looking to improve its security posture and better protect itself knows it needs 24/7 SIEM coverage. But for many, the costs of running a SOC are just too high. As you can see from the figures above, Managed SIEM makes a compelling alternative: for a fixed fee, it provides established technology and expertise, dependable and consistent action in the face of security events, and standardised reporting that makes it easier to evidence compliance. 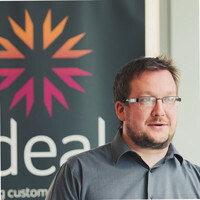 Want to know how Ideal can help you join the dots on your network?